Druchii.net - View topic - v. Seraphons: Lizard Mayhem! Here you see our armies. 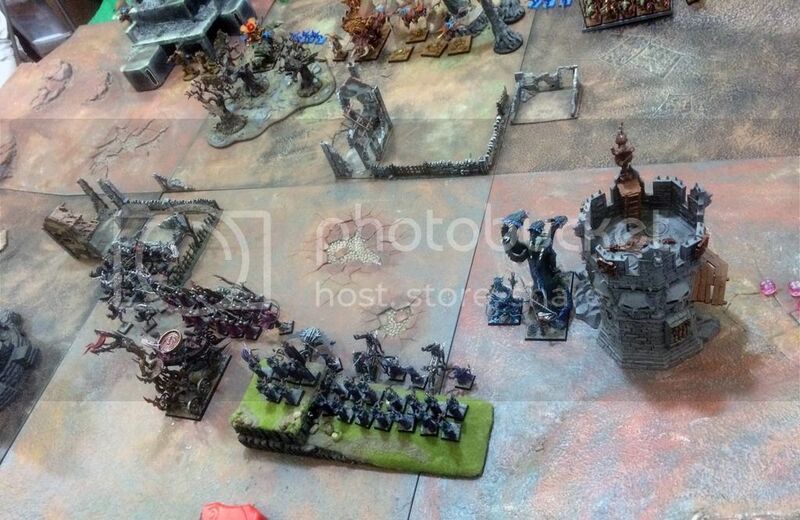 There is a lage unit of Saurus warriors, two Salamanders, six Terradon riders, an Engine of the Gods, Gor-Rok, an Oldblood, a Bastiladon, 3 Kroxigors, and (not seen) Kroq-Gar on a Carnosaur. I have Princess the Hydra, Aunt Maddie the Medusa, 20 Cross-bo's on the hill, 3 Reaper Bo Throwers below, Dreadlady Boanne (on foot this time! 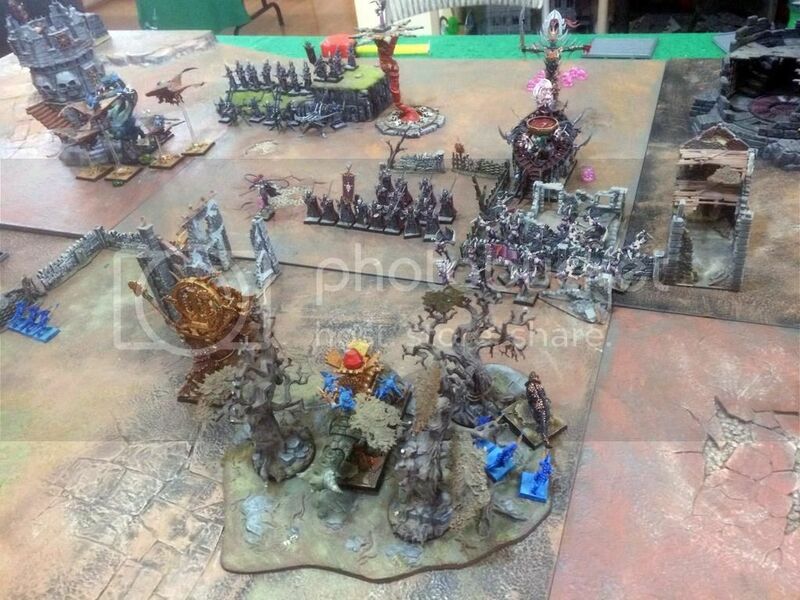 ), Aoifanne the Sorceress, Mhoireanne on a Cauldron of Blood, 15 Head Chop Bo's (executioners), and 20 Keening Bo's (witch elves). TURN 1: The Keening Bo's move forward into that fenced enclosure, which is damned. The Head Chop Bo's edge forward a little with Mhoireanne's cauldron behind them. Princess and Aunt Maddie also edge forward to protect that side. 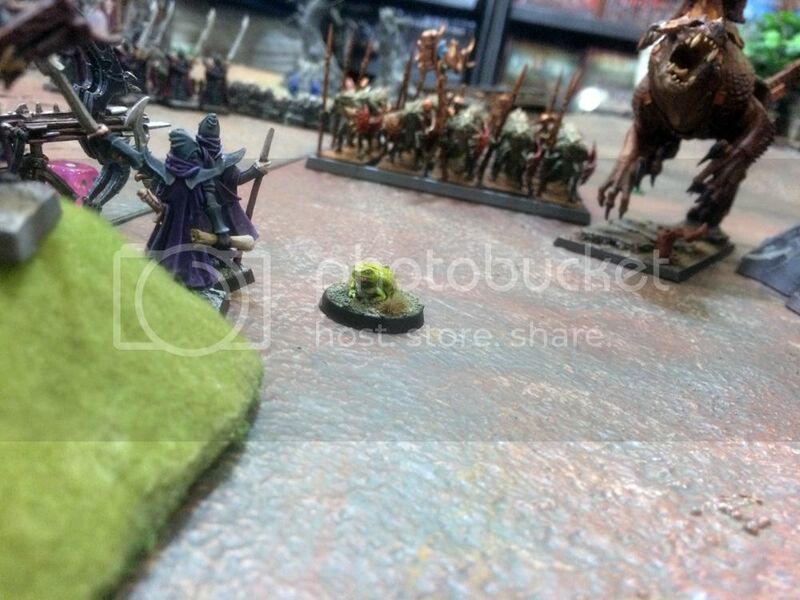 The Reaper Bo throwers kill 2 terradon riders and a salamander. The Terradon Riders charge Princess and Aunt Maddie, pecking Maddie to death and doing 4 wounds to Princess. TURN 2: My initiative again. While Princess regenerates 3 wounds and fights off the terradons, the Keening Bo's climb over the fence to charge the Bastiladon and salamander in the forest, the Head Chop Bo's go after the Engine of the Gods, and Boanne goes after Gor-Rok. Mhoireanne tries to give Strength of Khaine to the Keening Bo's, but rolls a 1 and does a wound to herself. With a cry of, 'Save Princess!' the Cross-bo's and Reaper Bo Throwers all shoot at the Terradon Riders. a) Princess fights desperately against the swooping terradons; b) Aoifanne summons a Balewind Vortex and casts Word of Pain on the terradons. Save Princess! c) The Keening Bo's charge into the forest, losing 4 casualties in the process, and kill the Salamander, but do only 1 wound to the Bastiladon, but the Head Chop Bo's chop the Engine of the Gods to death; d) Boanne fights Gor-Rok and loses. I'm disappointed by how much arse she *doesn't* kick! 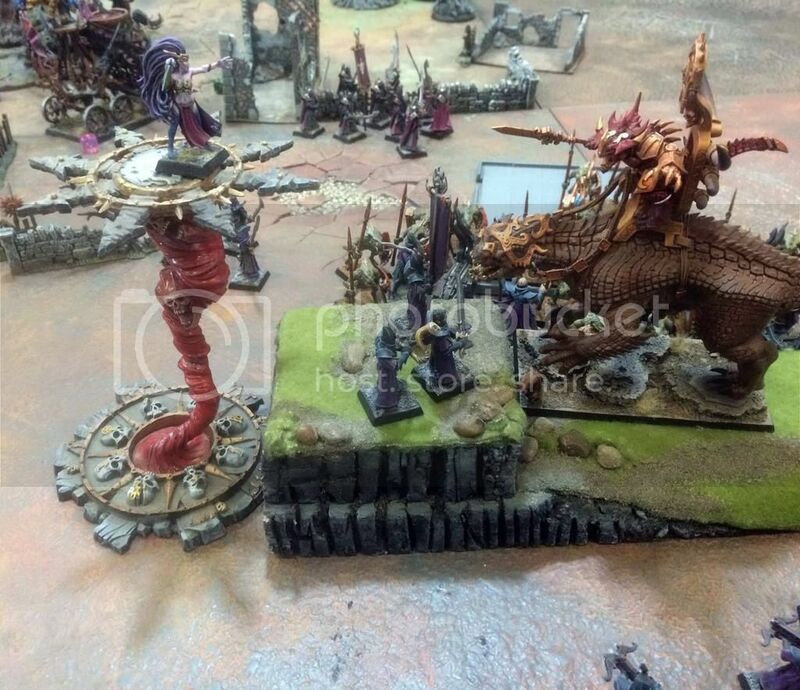 a) Kroq-Gar and the Saurus warriors charge Princess. I don't think we can save her from this! b) Gor-Rok foolishly charges the Head Chop Bo's, and gets his head chopped off. 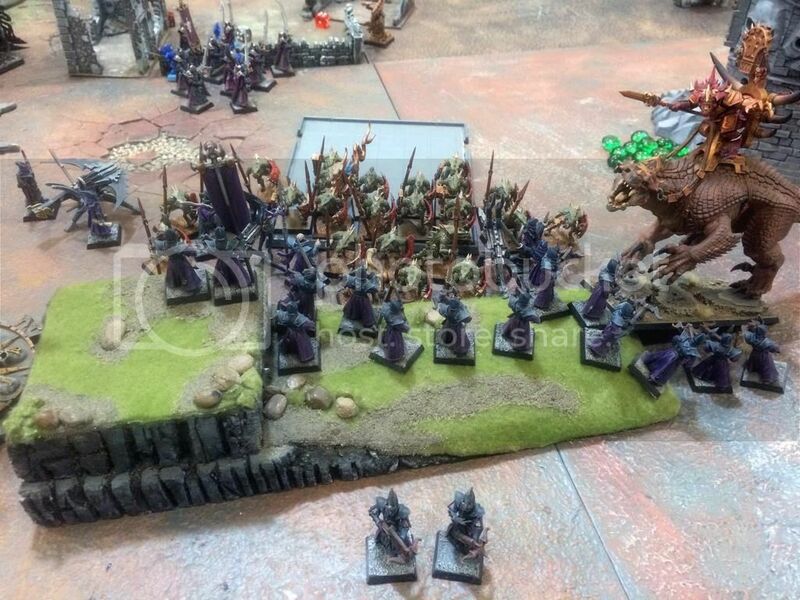 c) The Keening Bo's get charged by Kroxigors and kill one. ... I want the Keening Bo's to hit first, and they wipe out the Kroxigors. 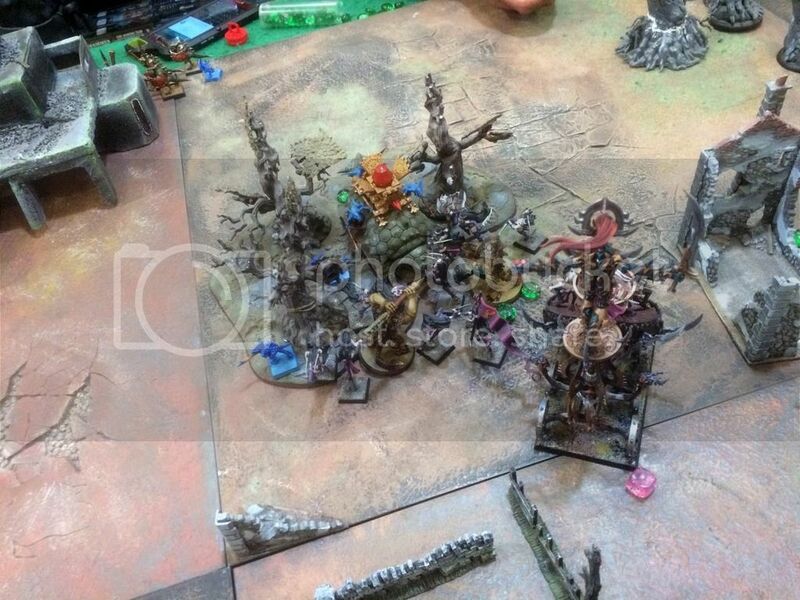 The Cross-bo's and RBoT's get charged by Kroq-Gar, the Saurus warriors, and the Oldblood. 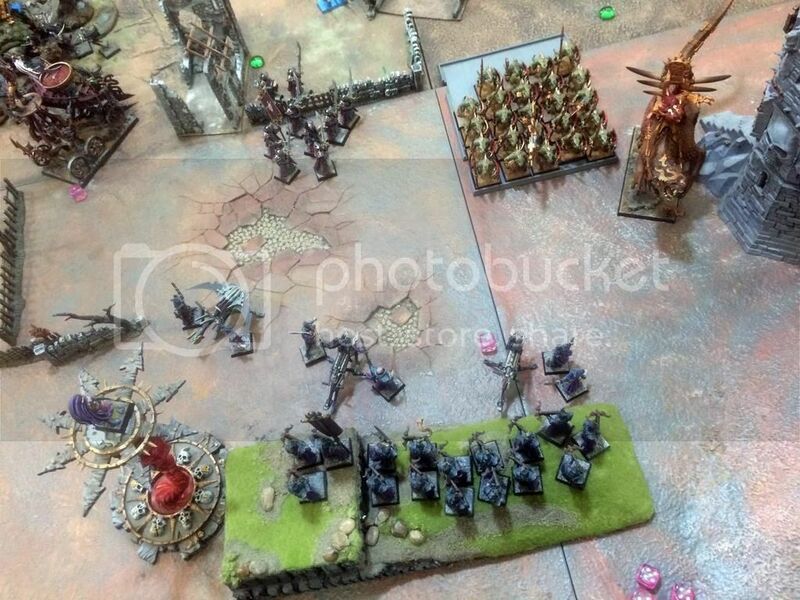 Due to poor dice rolling, having to divide their attacks, word of pain, and Kroq-Gar being badly hurt, they barely scratch us! 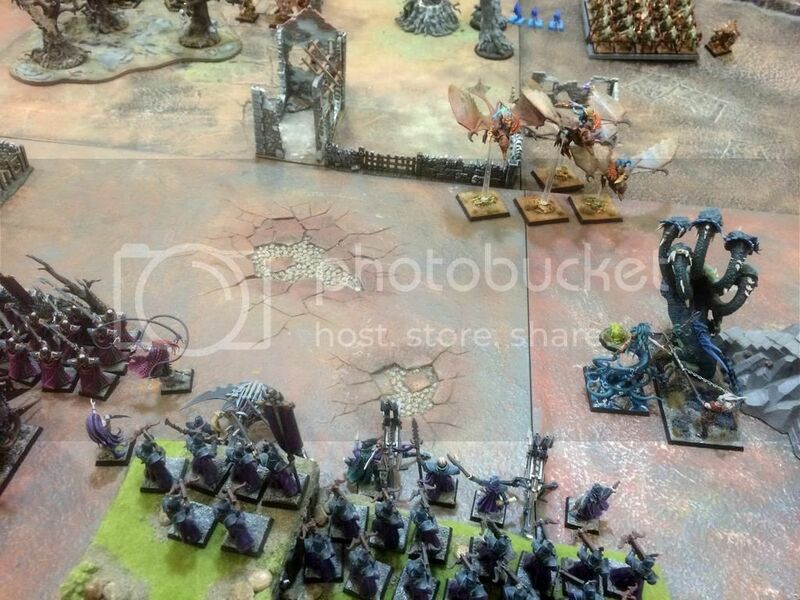 TURN 4: Aoifanne casts Arcane Bolt on Kroq-Gar, finishing him off. (We moved him a little to make the picture look more dramatic!) 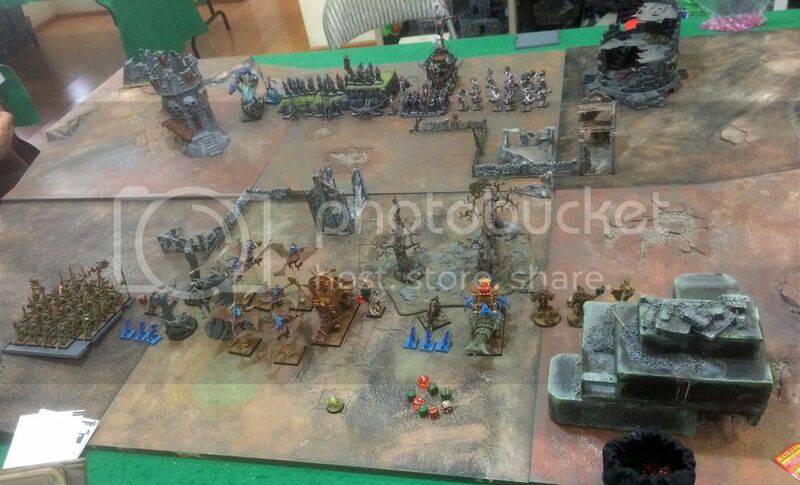 The Seraphon surrender. Conclusions: I don't know what it is about Princess that makes my oponents want to throw everything at her! Kroq-Gar was more than enough to take her on (before we stuck him full of arrows!). Aunt Maddie and Boanne didn't do too well either. I did have some amazing luck with saves in this game, and they had several turns when they rolled horribly, and that certainly helped! Re: v. Seraphons: Lizard Mayhem! Am I reading this right? He took no magic? That's fortunate! I am squaring off against Lizards on Sunday and I'm wondering how to deal with their ability to summon units. engine of the gods can have a skink priest on it I believe, also that bastilodon looks like the one that fires magic missiles or some such. Compliments for the batrep, for the win (good for morale before next tine you face ogres), and a special thanks for the dramatic pics, which add a lot of roleplaying in the batrep. Yes, correct on both counts, but to be specific, I meant characters with the "Wizard" keyword, who can summon almost any unit on the warscrolls. Then again, sending all that against Princess, right in front of the Cross-Bo's, Reaper Bo Throwers, and Aoifanne may not have been the best move either! I don't think he expected the Bo's to charge. At least, he seriously underestimated witch elves and executioners. They're not going to stand there getting shot by magic missiles and fire vomit, are they? He needs to expand his army, and frankly so do I! I'm already working on some cold-one knights, the Knights of Bo!